Here we have a look at Ostriv, a town builder that has been in development since 2014 by one person. Ostriv is a single-player strategy game in which you build and manage cities in late pre-industrial era. The events take place on a fictional island, where the player despite all troubles has to build a prospering state. I think I saw this on another Banished website and I thought "Wow, I'd love to have those models in Banished." Being in Australia with mostly British inspired architecture, the Eastern European architecture is somewhat exotic to me, familiar but stylistically different, so much so that I'm pretty certain that I'm going to buy this game when/if it becomes available. I have a dedicated model editor. It will have all the tools to create a custom building: navigation, special AI nodes, doors, animating parts, floor collision, procedural fences, construction animation and more. Also I'm planning on adding a landscape editor, because now I'm just using a bunch of .png images for elevation, forests, plants. Great. What about people wanting to mod beyond the existing functions in the game, for example adding new logic or expanding existing. 1. Hard to say right now. The number of existing logics is fair high. There's a lot of things actually being made by citizens, like turning a windmill to the wind direction, riding horses, plowing fields, using wheelbarrows, wagons, boats.. just chilling on a bench or whatever. So I think there's a lot to construct from, and I'm not sure which kind of other actions modders might want to implement. I'll probably watch for the feedback to see what kind of scripting should be added. 2. I don't really like the look of randomly generated maps. It's really hard to create a realistic landscape based on noise. I'm more inclined to use satellite imagery for elevation with some extra handwork applied. Maybe some day I'll figure some way to randomize it for better replayability. But for now I'll stick to prebuilt maps. 3. I think in Banished resource classes were just a result of UI decisions. There's currently no such thing as resource class in Ostriv. It's more like an unlimited list of resources with various properties. I am very excited for this game! I talked with the DEV privately and I am very optimistic. He seems to have the right approach and some interesting ideas how things should work. Can't wait to test the game during the alpha/beta test! The setting (eastern europe) is refreshing and I'm sure every history buff will agree with me when I say how underrepresented these countries are in this genre. The only thing that concerns me right now is the lack of randomized maps. But maybe they'll get added until release. With the Dev's approach to map making, there may be the potential for users to make their own maps perhaps? This looks pretty exciting! Even without random map generation, if one can use satellite imagery to create new maps, that's still a whole lot of potential variety. Maybe. Yeah sure, people will do it. Its not the same as a random map generator though. Even if theyre not as pretty. I coded a random map generator in unity last year and it gives some great results. As does banished, and other city builders. It seems a design choice of the developer that he wants and it his game so thats what players will get. I just visited the website to have a look around. I watched the teaser video on there and there's a mobile game being advertised right now on TV that his using footage from that teaser. Hmm, I am still a bannie, I don't think this will win me over completely but there are aspects I love about this, in particular the non-grid dependant placement of structures and I don't know if those paths were put in or were created by the frequent passage of the villagers. Keen to give it a go and find out. I'll buy it and give it a try when it will be out. 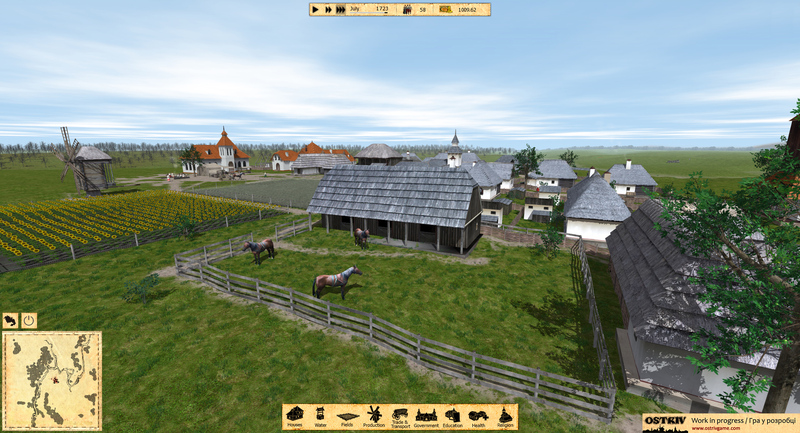 Like the idea of the buildings not having to be set in a NSEW direction like Banished. Having moving parts like the windmills are cool as well. Looks good. Its $20 U.S. and includes a link for the download. More info about game/developer is on the website. If you want to see gameplay look up Ostriv on YouTube. I've seen a couple of playthroughs on YouTube and it looks interesting but not a lot of content. I don't know if he's going to make a mod kit or how soon. I bought Forest Village when it first came out as an "early release". Mistake. I understand it has gotten better, but I still haven't tried playing it again. Made me swear off of early releases. However, I'm weak. Not too long ago, I bought Depraved as an early release. Really love it; now waiting for a full release. Banished does have A LOT of great mods and more are made all the time. I think you'll enjoy playing it for a long time.